Reuters has taken an important and trend-setting step with Reuters Africa. It is important in several ways. First, it demonstrates Reuters' commitment to covering Africa not only as a general news story but also as a global business story - to an extent that I have not seen in other global English-language media. As Reuters Africa editor John Chiahemen told The Guardian: "We want to show that Africa can be covered as a business story, not just a disaster story. While it is true that African information is available from other sources, there is no single media I know that has the breadth of content Reuters has available." Reuters Africa features an interactive map to access local Reuters news across the continent, organized by country. Reuters Africa also provides extensive economic, business and financial news and data, including stock and currency market data and company information, from around the continent. Reflecting the importance of commodities to many African economies, the site features exclusive online content on metals and mining, energy and oil, and agricultural commodities. This is important. My friend and colleague Ethan Zuckerman has written a great deal about how the global English-language media (and entertainment industry) needs to start treating Africa like a place and an opportunity - not just a crisis. In his work on global media attention, he shows how Africa gets the least amount of media attention than anywhere else (nobody is too surprised at this), but more interestingly he also argues (original pdf article here) that there is a connection between this lack of global media attention and the inability of businesses and policymakers in Western developed nations to take African countries seriously as destinations for investment and business. Is China's growing business influence in Africa now an added incentive for Western news organizations to take Africa seriously as a business story? At any rate, Reuters deserves kudos for taking the lead. It’s frequently depressing reading accounts of Africa in the mainstream media. Doubly so, in fact. Firstly because what is defined as worthy of reporting is, well, depressing. And secondly because it so seldom engages with the complex and vibrant reality of the continent in all its massive diversity, preferring instead to deal in simplistic stereotypes. 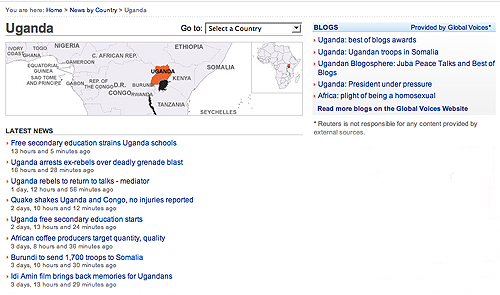 As you'll see from the screenshot that Rachel took from the Uganda page of Reuters Africa, each country page not only includes news headlines but also the Global Voices Uganda feed, pointing to blog posts coming from Uganda, selected by people like our amazing Africa editor Ndesanjo Macha. Mark Glaser at MediaShift has a great post titled Reuters Looks to Africa and a Decentralized Future for Media in which he interviews Reuters president Chris Ahearn on why his company has begun to take blogs seriously. 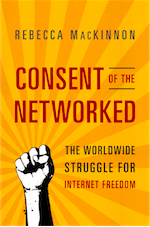 My favorite quote: "last I checked, the business we’re in is to inform people." Yup, and the bloggers we link to on Global Voices are as serious about doing that as journalists are. ...as we start to arm the quote-unquote mainstream with the same tools as journalists, editors and reporters have, there’s an interesting asymmetry here. I talk to a lot of people who say, ‘How come blogging software seems to be a richer news-telling experience than some of the tools we put into journalists’ hands?’ Interesting dynamic, that. The cost of newsgathering has plummeted. How do we take that and deploy more resources into newsgathering and news presentation? Why is it that right now, at a time when the world is getting more difficult to understand based on everything that’s happening are news organizations pulling out of so many places around the world? Why? It's worth reading the whole post to get a further glimpse into Chris' vision of where the industry is going, and why news organizations should recognize that we are entering a "golden age" for journalism - not leaving one. There’s a rising tone of anxiety and despair in the Zimbabwean blogosphere, for instance, but it won’t ‘break’ as a story unless the civil service strike goes off tomorrow and sparks a violent government response,” Zuckerman said via email. “In a perfect world, I think we’d find a way to help our friends at Reuters anticipate stories that might break based on our coverage — that hasn’t happened as much as I’d like. This is a great step forward, but there’s still a long way to go. There are large and exciting blogging communities in several countries, such as Nigeria and Kenya but there are other areas where coverage is very sparse and still others, such as Ethiopia and Zimbabwe, where online expression is severely curtailed by the government. We hope that the involvement of bloggers in projects such as this not only gives a platform to those whose voices have long been left unheard but also encourages others to join the conversation and brings pressure to bear on behalf of those who want to speak but cannot. I wrote in the comment section of my NewAssignment.net post about how news outlets should harness the power of communities that: "While this is a step in the right direction, Reuters simply displays links to posts from African bloggers. Hopefully, the news organization will not simply view this as its way of paying attention to the blogosphere and take it a step further by actually interacting with bloggers themselves." Am I wrong? Is Reuters doing more with Global Voices bloggers? It's nice to see Reuters and others charting these waters. I can only hope that once these valuable blogs make it past the first hurdle of local censorship, they can penetrate our own epidemic of internet, "Western" censorship and political correctness.